Volunteers Are the Heart of Hospice. . . . How can I help? FIRST CHOICE HOSPICE OF UTAH Needs You! 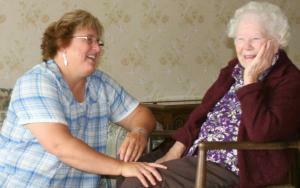 Hospice volunteers are men and women (age 18 and older) who have a sincere desire to help others make the most of life. First Choice Hospice of Utah Volunteers are prepared for their role with a free, comprehensive training program. No previous experience in the medical field is necessary. Through training, hospice volunteers learn how to give the gift of the heart in providing emotional support, companionship and respite care to our patients and families. We encourage people interested in volunteering with Hospice to discuss their interests and talents with our staff so that we can make your volunteer experience as rewarding foryou as it is for First Choice Hospice. If you would like to learn more about volunteering for First Choice Hospice of Utah please call or email Cheryl Dalton, Volunteer Program Coordinator.